FFWPU USA: On May 24, thousands of Unificationists attended the Sunday Service with True Mother at the Manhattan Center, and the rest of the American families watched via live broadcast. The program opened with lively songs from the Family Church of New York City band, as well as the Generation Peace Academy choir—coordinated in colorful, springtime red and pink attire. The audience sang along joyfully with power and rejuvenation, picking up the spirit by swaying in unison, snapping their fingers and clapping their hands. After the welcoming musical warm-up, Dr. Michael Balcomb, President of the Family Federation for World Peace and Unification (FFWPU)-USA introduced himself as the emcee, welcomed the guests and introduced a video testimony of True Mother’s recent tour in Europe, celebrating 50 years of the Unification Movement in Europe. Miilhan Stephens, Vice President of FFWPU USA, read a Hoon Dok Hwe (scripture) message from the Cham Bumo Gyeong, the third of the Holy Scriptures which will be published in English on the third anniversary of True Father’s Seonghwa this year. The reading provided a crucial background to True Mother’s message later that day, describing the historical mission of True Parents, True Father’s path and the mission of Unificationists today. Dr. Kim announced the completion of the English translation of the Cham Bumo Gyeong, and urged everyone to make the study of the three Holy Scriptures their top priority this year, so that we can fully understand True Parent’s life course and how we can carry their legacy forward. The audience applauded with resounding agreement and conviction, and the program transitioned into a video of highlights of True Mother’s work during the last 1,000 days. These accomplishments included the Holy Marriage Blessing, the Holy Scriptures, the Cheon Il Guk Constitution, the archiving of historical records of the Unification Movement, work with the United Nations, the planning of the Cheon Ji Seonhak Won museum, and most recently, the revival and determination for Tribal Messiahship. Next, another video was presented of True Mother’s recent messages, culminating in a shared sense of clarity and reinvigoration for the entire audience as they reflected upon the last three years and the direction in which True Mother is leading the Unification Movement. After these video highlights, Seiko Lee performed a musical offering of “Arirang,” one of True Mother’s favorite songs. Her beautiful song received enthusiastic applause from the audience, and was a beautiful welcome for Sun Jin Moon, International President of FFWPU, to come on stage and give an introduction to True Mother. With that heartfelt, moving introduction, True Mother came to the stage and was greeted with wide smiles, endless applause and the singing of “Happy Victory” as she received flowers and a mountainous cake. True Mother playfully motioned a toss of her bouquets to the audience, reflecting the beauty and grace like that of a young bride. True Mother then began her message to the American Unification families, reminding everyone of their role as the nation leading the way for the world. “This is a time of harvest,” she began. 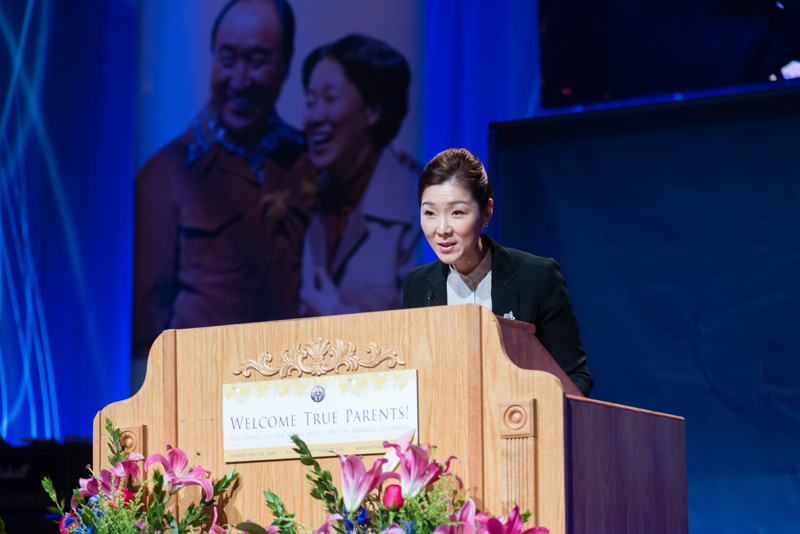 “All of your dreams are coming true—that is my prayer for you.” She implored the audience to remember their identity and mission, to study Korean so that the world of God can be united under one common language, and to grow their roots. Using the analogy of the olive tree, which grows its roots for 50 years to adapt to the barren desert environment, and then survives another 2,000 years, True Mother urged everyone to invest themselves and grow profound roots, so that whatever happens they will remain unshaken. True Mother asked the audience how we can start a new 50 years, filled with hope and with a renewed determination, completely different and rising beyond anything we have ever done before. “Blessed families, when you look at your lives and the time left on this earth, it is not much,” True Mother continued. “Each one of us and our tribe need to work to fulfill our tribal messiahship mission together.” She closed her message by asking everyone to spread the truth and spread hope for the future, and the audience responded in genuine agreement and understanding.